Most nitrogen-fixing bacteria in commercial soybean inoculants originate from subtropical regions, just like soybeans themselves. But are subtropical inoculants really the best choice for Canadian soybean production? Recent research shows some native Canadian bacteria are much better nitrogen fixers for our short-season soybean cultivars. “Symbiotic bacteria have the ability to form swellings called nodules on soybean’s roots and to fix nitrogen from the atmosphere and convert it into nitrogen compounds that can be used directly by the plant. This process, known as symbiotic nitrogen fixation, enhances crop productivity while reducing the need to add nitrogen fertilizer to crops, which in turn minimizes negative impacts on the environment,” explains Eden Bromfield, a research scientist with Agriculture and Agri-Food Canada (AAFC) in Ottawa, who is leading this research. Bromfield hypothesized that nitrogen-fixing bacteria associated with native legumes in Canada are adapted to our short-season conditions so they might be more suitable than subtropical bacterial strains for nitrogen-fixing symbiosis with Canadian soybeans. 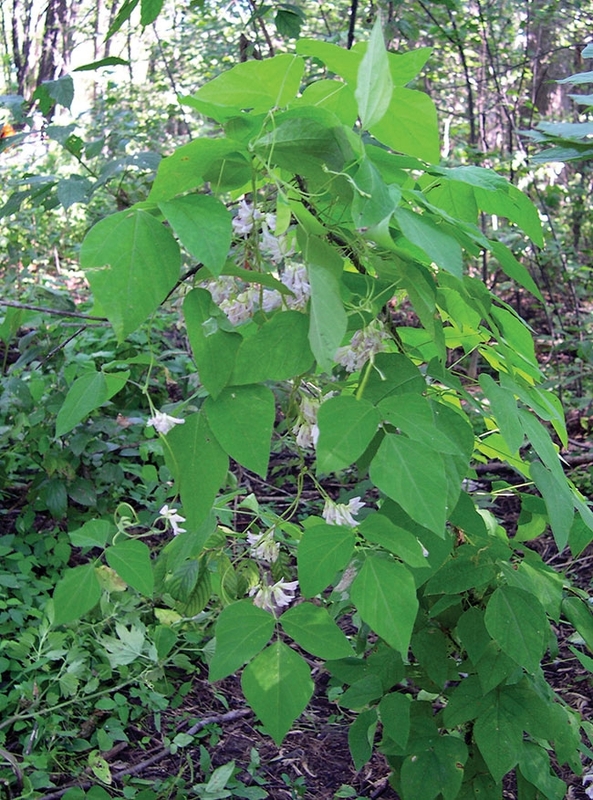 In his search for promising bacteria, Bromfield targeted four wild legume species – Amphicarpaea bracteata, Apios americana, Desmodium glutinosum and Desmodium canadense – which are all native to Eastern Canada. He notes that both Amphicarpaea bracteata and Apios americana were food sources for indigenous peoples. “Amphicarpaea bracteata is known as hog peanut. It is quite closely related to soybean. It produces an aerial seed and a subterranean seed. The subterranean seeds are about the size of a peanut, and they are edible and very nutritious. Apios americana [sometimes known as groundnut] is a vine with subterranean tubers, which are a rich source of carbohydrates and proteins.” Desmodium glutinosum is known as pointed-leaved tick trefoil, and Desmodium canadense is called showy tick trefoil. Bromfield says, “We started this research by going out and finding native legume populations. All of them were growing in deciduous woodland areas with no history of agriculture. We sampled the soil around the roots of each of these legume species at multiple sites in Eastern Canada, mainly in Quebec. Then we prepared soil suspensions from these soil samples, and inoculated them onto two short-season soybean cultivars.” Some of the bacteria in those suspensions were able to form nodules on the soybean plants. Next, Bromfield and his research group isolated bacteria from those root nodules, making more than 800 different isolations. For each of those isolates, the researchers sequenced six genes that are essential for bacterial survival and two genes required for symbiosis. Based on sequence analysis, they were able to identify the species of the bacterial isolates. They found a remarkable diversity of species. They discovered eight previously unknown Bradyrhizobium species as well as novel species in two other genera. They also found four known Bradyrhizobium species. Then, they inoculated each of these bacterial species onto short-season soybean cultivars and grew the plants in the greenhouse under controlled conditions to evaluate the ability of the bacteria to fix nitrogen efficiently. Through this research, Bromfield and his research group have made several other discoveries that have scientific importance and could have direct or indirect relevance to agriculture. For example, Bromfield’s research has provided definitive evidence for the horizontal transfer of symbiosis genes in the field. Horizontal transfer is the movement of genetic material between different bacterial species. This mechanism has significance in many issues; in medicine, horizontal transfer and spread of antibiotic resistance genes has contributed to the creation of “superbugs” with resistance to multiple antibiotics. Another interesting finding is the discovery of a new set of genes for symbiosis. “We found a group of four novel species which possess novel nodulation and nitrogen-fixation genes . . . These species nodulate soybean plants but they don’t fix nitrogen, so they don’t have direct applications for soybean production.” They might turn out to have some other agricultural application, such as symbiosis with a different legume crop, or to shed light on symbiotic nitrogen-fixation processes. Bromfield and his research group are at work on one of the next steps in this research, which is to formally describe, name and publish the novel species so that these species can be identified and used by other researchers and by inoculant companies. This work includes whole genome sequencing of each species. Bromfield has already published a new bradyrhizobia species that he discovered in the Ottawa area; it is very efficient at fixing nitrogen with soybean and is called Bradyrhizobium ottawaense. A key next step is to test the novel species that were efficient nitrogen fixers in the greenhouse to see how well they perform under field conditions with short-season soybean cultivars. The potential for some new, improved inoculants for Canadian soybean production is exciting. “We have identified Bradyrhizobium bacteria that are much more efficient than the widely used commercial inoculant strain that we tested. They are presumably adapted to short-season symbiosis under Canadian conditions because they were taken from native legumes that have evolved and developed under short-season conditions in the soybean-growing areas,” Bromfield says.